Went on another dryer service call the other day. Complaint on this one was that the dryer was completely dead, no lights, no beeps, no nuttin’. It was, as we master appliantologists say, dead on arrival. Pop Quiz: What’s the first thing you check when you’re dealing with a dead appliance? Answer: The power supply. 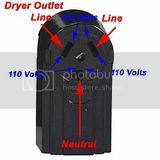 In this case, make sure you have proper voltage at the wall outlet that the dryer plugs into. These pics show you the anatomy of both the three-wire and four-wire outlets. Click ’em for a larger view. Did you find it? I knowed you could! Loose connections make heat… sometimes LOTS of heat. Be sure the nuts on those power strip studs are GOODNTIGHT! In this case, so much of the pigtail wire was burnt up that I had to install a new one. You can, too. Piece of pie, tovarish– come git you one! 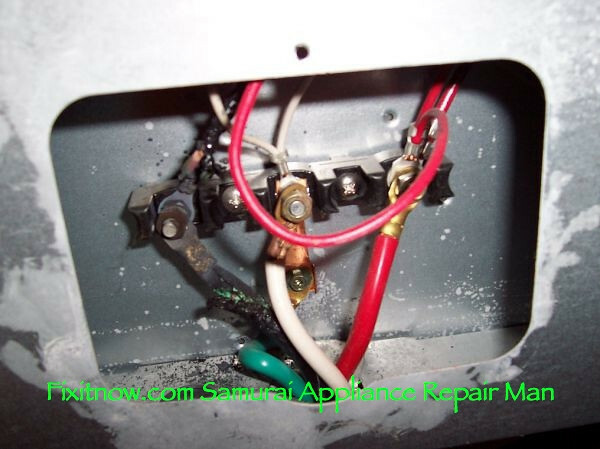 This entry was posted in Dryer Repair on October 2, 2009 by Samurai Appliance Repair Man.